How to Set up and Pair Apple Watch with Your iPhone? - First of all, you have to consider the OS of your iPhone. To pair your Apple Watch with iPhone, you should be sure the iOS 8.2 or a later version has been installed on your iPhone device. This is mainly because the Apple Watch app is only can be operated in the device with the system of iOS 8.2 or later. - Please be sure the Wi-Fi network and Bluetooth are opened in your device. - Press and hold the side button of your Apple Watch for seconds until the Apple logo appears. Then, you can select the language for using the device. - The whole pairing process could be a little bit time-consuming, so please make sure both of your Apple Watch and iPhone are fully charged before you start the process. Note: Because the Apple Watch app can only be launched on the system of iOS 8.2 or later, so the compatible iPhones are iPhone 5, iPhone 5C/5S, iPhone 6, iPhone 6 Plus at present. 1. Run Apple Watch app on your iPhone, and hit "Start Pairing" button to begin the connection procedure. 2. Aim the camera of your iPhone at the Apple Watch screen. You just act what the app requests and it will automatically pair the Apple Watch with your iPhone. When your Apple Watch is paired successfully, an animated dot cloud will turn into an attractive graphic to demonstrate that you have succeeded. If the pairing process fails, you can pair it manually as well. 3. Now, you will be instructed to accept the terms and conditions, diagnostics, and approve your gadget through iCloud, which are not options, but mandatory. You will also be asked to create a password, which is typically a four digit number or more than that in length. 4. If you would like to unlock your watch by iPhone, you have to enter the password and wait for synchronization. The watch will go through all your apps and it will load the ones, which are watch-set. A gradually filling progress will circle around the Apple symbol will count off your progress, which will take more than 10 minutes. Now, leave your iPhone and plugged in, together with the watch, and after 10 minutes the pairing process will be completed. How to Update Watch OS on Your Apple Watch? Watch OS 2 is available since the latest Apple WWDC 2015. So if you wish to update your Watch OS to the latest one on your Apple Watch, you can follow the below steps as you like. 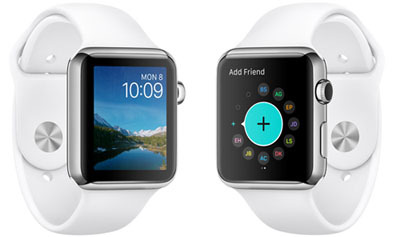 The updates of the Apple Watch software are similar to that of the iPhone software. As the watch is paired with your iPhone for accessing the Internet and for managing the device easily, Watch OS updates are not done on the Apple Watch directly. Instead, they are performed by making use of the Apple Watch for iPhone app. To get started, please ensure that you have the iPhone ready and turn on the Wi-Fi, and your watch is charged to more than 50% and attached to its magnetic charger. Now connect your iPhone to Wi-Fi and initiate the Apple Watch app. 1. Click on the My Watch tab and choose the "General" option. 2. Hit the Software Update key and choose the "Download and Install" option. 3. Now you need to enter your iPhone password and tick the "Terms and Conditions" box. 4. Tap "Install" on your iPhone or Apple Watch. Now the downloading of the Watch OS update will start and it will transfer the data to your watch and your watch will boot again to apply the update. You will be capable of following the progress of the update on your Apple Watch screen, and once it is completed, you will be all set. If there are something lost due to the system upgrading, you can recover data from Apple Watch by following tutorial here. Besides the contents we mentioned above, it is no doubt that there are also lots of other tips & tricks you may also interested in, such as how to make a call with Apple Watch, how to send or response messages on Apple Watch, how to check and listen voicemail, or launch app with siri on Apple watch and so on. It is no doubt that there are still lots of useful tips & tricks of Appe Watch you have to learn.